You don't need to spend too much time in the watch world to realize that there are quite a lot of dive watches out there. It seems every watch maker tries its hand at this style, and we, the watch nerds, rejoice. You can't blame us. They look cool, and there is something irresistible about a device that exceeds your own abilities, but considering the sheer volume of diver's watches (and some truly dodgy "dive style" watches), you would think we were all part fish. Of course, nothing is farther from the truth. Sure, a small percentage will be used for recreational diving, but the vast majority of dive watches will never see a greater depth than the bottom of a swimming pool. Then there is the tiny percentage that will venture to harrowing depths, day in and day out, on the wrist of a man like Paul Scurfield of Scurfa Watches. Paul did not set out to sell watches to the public. He is a professional saturation diver working in the North Sea off the coast of the United Kingdom, and he has a perfectly good Rolex -- just maybe a little too good. Back in the day, it seems everyone had a Rolex, says Paul. "If you went on any diving vessel in the North Sea about 8 years ago you would come across all the Submariners, Comex Sea-Dwellers, Mil-subs, double reds," he explains, "then the prices went crazy." Before long, the watches became too valuable to wear for their intended purpose. The divers still needed a suitable work watch, but they did not want to risk destroying an investment grade piece every time they set to work. Not satisfied with the other options on the market, and being a watch nerd himself, Paul decided to commission his own, and the Diver One series was born. The Diver One series takes its name from the designations of the team members. "Divers working in the North Sea are made up in teams of three and on any working dive you have a diver 1, diver 2 and the bellman." Paul explains. "Diver 1 controls the dive, diver 2 is there to make his job easier, and the bellman tends the divers from the diving bell." He originally planned a 42mm model on a silicone strap, but his fellow divers had particular preferences. "You had the ex-navy lads wanting NATO straps and the lads who were used to wearing Rolex's wanting stainless steel," he explains. He ultimately produced three distinct models: a 42mm on a silicone strap (£124), a 40mm on a bracelet (£124), and a black DLC coated 40mm on a NATO strap (£114). Paul supplied a NATO model for this review. When humans dive to great depths, our tissues become saturated with dissolved gas. When ascending, the gas can decompress into bubbles, creating a dangerous condition known as decompression sickness or "the bends." Saturation diving is a technique in which divers remain in a pressurized environment to maintain the saturation of gas in their bodies. This reduces the number of decompressions and the accompanying risk. In Paul's line of work, divers live and work in a saturation diving system that houses four teams of three divers, working in twelve hour shifts (six in the water/six out), over a full twenty-four hour work day, stopping only for bad weather or crew changes. The work period for the divers is 28 days including decompression. It is a demanding environment that demands a tough precision instrument, and Paul had some strong ideas on how to accomplish this at the right price. For starters, it had to be quartz. As Paul bluntly puts it, "Automatic watches offshore are a pain in the arse. They stop if you don’t wear them. They stop if you knock them hard enough. They don’t like magnetism and you get loads of that when you’re diving." He chose a Ronda Powertech. It may not be the sexiest movement, but it does the job, cheaply and reliably, with the usual quartz precision. Durability and pressure resistance were essential. The Diver One is rated for 200m water resistance. It is equipped with flat, anti reflective sapphire crystal. The case is 316 stainless steel with a screw-down crown, and a solid screw-on case back. The crown sits at 3 o'clock, flanked by angular guards. It is textured, but unadorned. Interestingly, Paul chose not to include a helium release valve. While this feature is nice to have, the same result can be achieved for free by simply unscrewing the crown. Size and weight also had to be considered. Oversized cases may look mean, but neither Paul not his fellow divers cared to wear a bulky chunk of steel for a twelve-hour shift, so 42mm was the maximum. The Diver One NATO that I sampled has the smaller, 40mm round case, which is a perfect fit on my 6.5" wrist. It presents a flat profile with only slight curvature at the lugs, but given its small size, it sits comfortably. The case is brushed on top and polished on the sides, which offers a nice dimension to the black coating. The watch face of the NATO is a traditional dive watch design: black aluminum unidirectional bezel, black dial, white minute index, rectangular hour markers with a double bar at 12 o'clock, black-on-white 3 o'clock date window, and bright orange swords with a lollipop sweep hand. It is familiar, but highly legible and nicely executed. The hour markers and all three hands are treated with Swiss Superluminova. The boxed Scurfa Watches logo in the upper part of the dial is large, but the fine lines of typeface and frame prevent it from appearing overbearing. The model name in the lower half is stylized and similarly slim. "Swiss Movt" is discreetly buried under the 6 o'clock marker. Water resistance and other specifications are wisely consigned to the engraved case back. It is an attractive, balanced design. The unidirectional bezel has a dive index printed in silver with an inverted triangle at top center. The bezel is the one element I would be inclined to change, as it has no illumination. Doubtless, an engraved Superluminova index would add considerably to the cost, but a simple lume pip likely would not. If you must have this feature, you will find it on the 42mm Diver One Silicone. As you may have guessed, the NATO model is shipped with a NATO strap, and a heavier Zulu as well. Both are 20mm wide and black nylon with black hardware. They are stitched, but not sealed. The Zulu is a stiff and heavy weave with properly thick hardware finished in a glassy black. 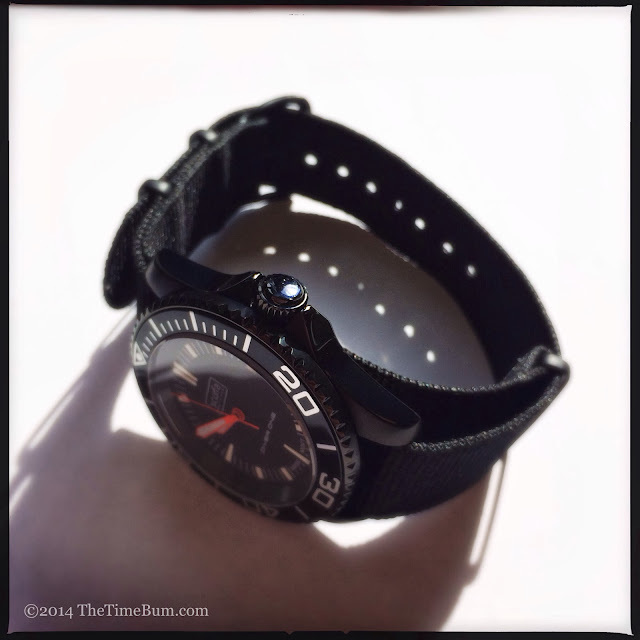 The NATO, of course, is a lighter weave and its slim hardware is matte black. Being small wristed, I preferred the NATO, which I find to be in better proportion to the modestly sized case. Still, it is nice to have the option. Both straps struck me as perfectly workable but not terribly special. I would be inclined to spend a little on an aftermarket upgrade. It should be easy to find strap money to spare after purchasing a Scurfa. The NATO model costs £114, or approximately $191 at current exchange rates, shipping included. So, has Paul accomplished his goal? He thinks so. "I set about making what the lads wanted and I'm happy with the end result," he says. "I've got designs for more and I will be making automatic watches as well, but I'm in no hurry." The Time Bum agrees. 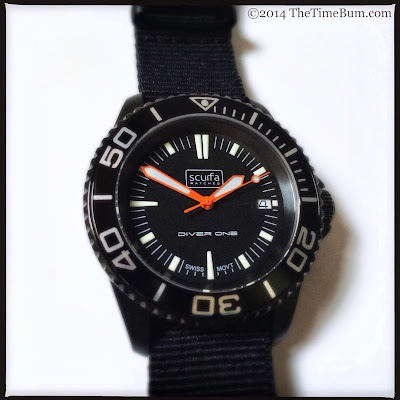 The Diver One is an intelligently designed and nicely executed dive watch. It is sporty, but understated. As you can see in Paul's dive videos, it is more than capable as a working dive watch, but a black leather or sailcloth strap could easily dress it up for adventures above sea level. 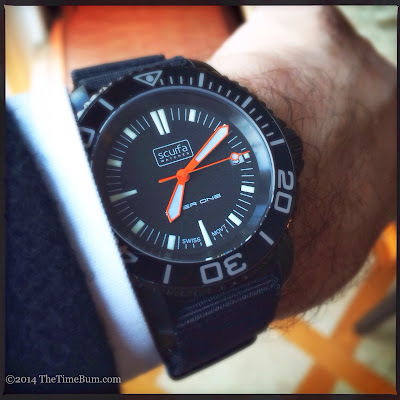 Pro: A capable dive watch at a nice price. Con: No lume pip on bezel. 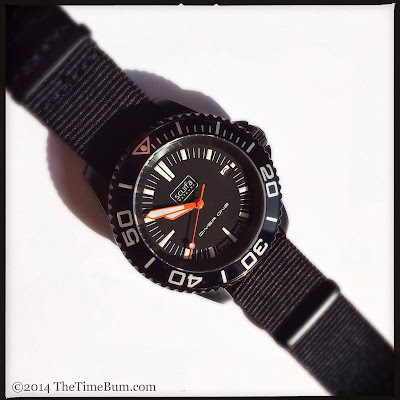 Sum: A professional diver's watch, made by a professional diver, for professional divers. The Time Bum approves.